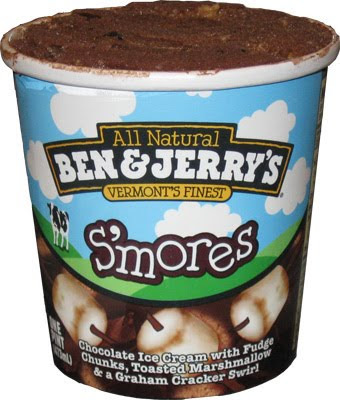 [2015 Update] Quick update to let you know that S'mores is alive and well in Ben & Jerry's new non-GMO world. It's a fun flavor that belongs on their menu, though the review below may sound a little down on it. It's not that it's bad, it's that there are other flavors out there with a much stronger graham flavor. The squishy swirl is calling your name! 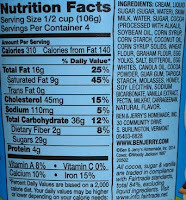 [Original Review] It has been almost two months since I've had Ben & Jerry's on the blog ...wow, I can't believe it's been that long, time really does fly as you get older. No matter, I picked up three flavors at Market Basket: One because it had a fun name, one for St. Patrick's day, and S'mores. 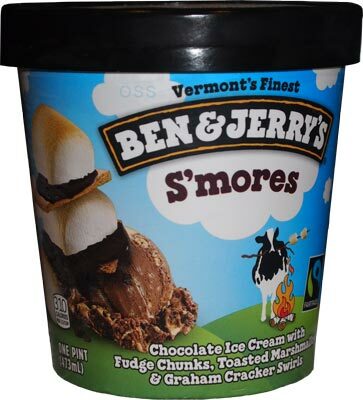 I'm not sure why I haven't tried Ben & Jerry's S'mores ice cream sooner because it really does sound awesome: Chocolate Ice Cream with Fudge Chunks, Toasted Marshmallow & a Graham Cracker Swirl. Mmmmm, how can you go wrong with that? And when will I learn to not jinx myself by asking silly questions like "how can you go wrong with that?" Wow, now that is some seriously dark colored chocolate ice cream. Notice a very healthy smattering of fudge chunks everywhere. The lighter spots are a solid marshmallow swirl, while the tannish spots are these funky semi-moist graham cracker swirl spots. 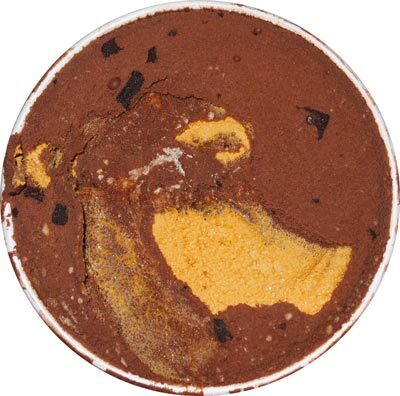 To be honest, I'm wondering if this pint was thawed at some point, the texture just looks weird. It's also possible that the ingredients, in particular the marshmallow, come together and totally mess with the melting point of the ice cream. I had just pulled this from the deep freezer and you can see it's already starting to melt. I might expect this on some super crazy hot day in august, but not on a cool night in march. Ok, nevermind the fast melting, how does it taste? CHOCOLATY, really really CHOCOLATY. I think this may just be a general trend in B&J's ice cream, but I wasn't ready for it. The problem, for me, is that the chocolate is overriding everything. I can crunch the fudge chunks, but I don't really taste them. The marshmallow and graham cracker swirls are practically non-existent. I think the swirls might be messing with the texture a little bit, but even when I try to eat slow, I can still barely taste them. Bummer. Now I was technically eating out of the container and a bowl at the same time. I ate the bowl part after it had melted further and it did make for a fine and extremely rich chocolate slush. Tasty and borderline overpowering. If you need a massive chocolate blast to keep you up for a test or to do your taxes, this should suffice. As always, it's a quality product, I'm not questioning that, but I do question why you call something S'mores but don't really let the other ingredients be anything more than decoration. Guess we'll just have to wait and see how the second scoop goes. On Second Scoop: I was dying for some chocolate when I got home from work the other day, so what better way to fix that craving than with some very chocolaty Ben & Jerry's. As always, I don't want to give the impression that this is a bad ice cream. 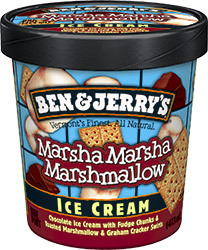 It's well made and the chocolate flavor is excellent when you are in the mood, I just wish it tasted more like S'mores. I purposely aimed for the grahamiest spots I could find, so I was getting a bit more texture to my bites, but I still wanted more. Maybe I'm just hard to please. So, this is a fine flavor, I just think it could be more S'morey. It melted faster because it doesn't fully freeze because of the marshmallow in it. Sometimes if there's not enough of something I like (in this case, graham crackers) I'll crush some up and add my own to it. This used to be called Marsha-Marsha-Marshmallow (yes...an homage to The Brady Bunch). @April: Good Idea! Bet some whip cream wouldn't hurt to. 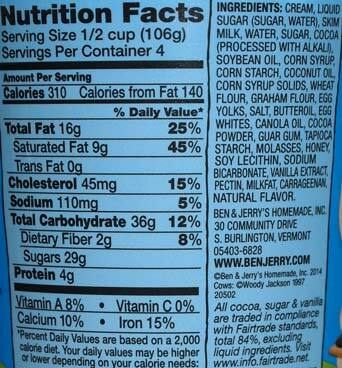 I agree with the review -- it's a really GOOD dark chocolate ice cream, with only the barest hint of other ingredients. If I didn't know they were marshmallow and graham crackers, I would never have been able to identify them. It's delicious in its own right, and I will buy it again .. just don't expect smore's flavor, because it's hidden away good. Tried it for the first time today, and I think it tastes EXACTLY like the Hershey's "S'mores" chocolate pudding, and also chocolate frosting. I think I got "frosting vibes" due to the marshmallow swirl mixing and melting into the base. A very tasty chocolate base, but like you said, it needed more marshmallow and graham. I feel like this would've been a homerun as a "Core" flavor. 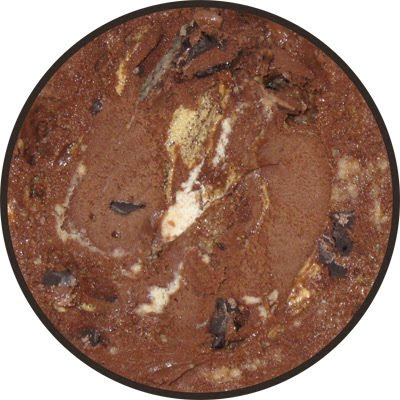 The dark chocolate base on one side, a toasted marshmallow flavor on the other side (Nestle got it right, so I KNOW Ben and Jerry can) and a core of "cookie butter" made out of graham pie crust. Now, THAT would've been the perfect s'mores ice cream. Ah well...At least there's Nestle s'mores drumsticks.